Rain gears to protect yourself from the rain. Our rain gears are of good build quality and works as what it's designed for. This BonQ Poncho is multifunctional. Through the buttons and the drawstring, you can use the Poncho in several ways. 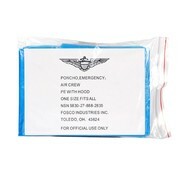 The Fosco Emergency Poncho is a one-size-fits-all poncho that is made of 100% plastic and is fitted with a hood. This poncho is made to keep the most important part of your body dry during every rain shower.